You might think the best news from 2014 was that Matthew Guy is now the former Minister for Planning! However, his decisions rested on reports from the Department of Planning. Some of these were recently released, thanks to pressure from the City of Melbourne. Nearly every report was in favour of the proposed towers and when a heritage building was involved they clearly stated that keeping only a facade was ‘an appropriate heritage response’. Some of the councillors of the City of Melbourne have also proved themselves to be more development than heritage friendly when it comes to the CBD. One of the overarching themes was that the former Minister refused to employ the standard interim heritage listing controls during his tenure. This meant that many buildings and precincts identified in the City North heritage study (such as the whole west side of Elizabeth street near the market) remained unprotected through the year. The formal process is still underway, and now has to be accepted by Council and approved by the new Minister. The former Minister also did not approve any of the nine mid-century modern buildings recommended for protection in 2013, saying that more work would be done, but nothing was heard through all of 2014. The issue that grabbed the most headlines last year was the fate of the Palace Theatre. This was a truly sorry saga. It prompted a surprisingly strong reaction by the former Minister against the tower (with height limits strengthened) and slow reaction from the City of Melbourne to protect the ornate interior, which was stripped by the owners Jinshan Investments before a decision to protect it could be made. The developer’s new proposal for a much shorter ‘boutique’ hotel to replace the theatre is scheduled to be heard at VCAT in February. It will be interesting to see what happens in 2015. Here is a summary of most of what happened, and what is yet to come. During 2014 there were was only one truly major loss, the mid-century modern 1965 National Mutual Plaza. The demolition of this building commenced following the previous Minister’s refusal to approve its heritage listing in 2013, and the dramatic failure of the marble cladding. 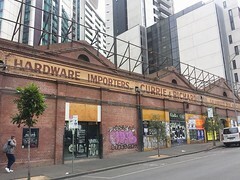 Some smaller Victorian places that were not heritage-listed were also lost, including the 1866/1874 ‘Baltic Imports’ at 670 Flinders Street (demolition had been approved years ago and it had been covered with mesh for some time) and the 1878 Burton Livery Stables building at 40 Latrobe (following a controversial permit granted by Council in 2012[link]). The fate of the 1916 Edwardian redbrick arched factory building at 56 A’Beckett street and the adjacent neo-classical car showroom (also 1916) were sealed by the granting of a permit for a 56 storey tower. Many smaller, often industrial, pre-WW2 buildings were also turned to rubble to make way for towers; the character of Latrobe Street up from Elizabeth Street is changing fast. A major initiative of the City of Melbourne was the adoption of their Heritage Strategy, which should see the creation of new guidelines for the CBD (as well as outside the CBD) sometime this year. They are sorely needed as the current ones are short, vague and open to challenge at VCAT. MHA is in discussion with Council. This landmark 1926 building, long abandoned and deteriorating, was refurbished in 2014 for use as a private college, and the exterior has been painted, and the damaged plasterwork of the grand lobby restored. 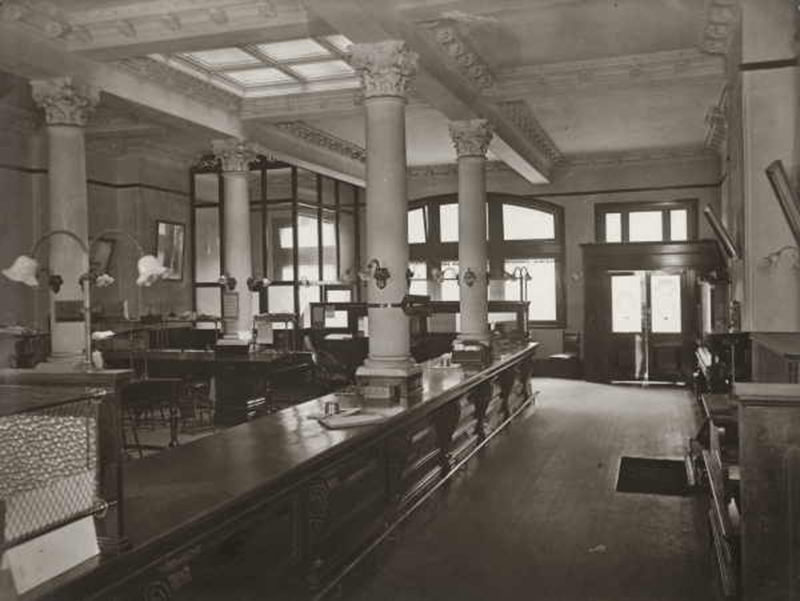 The Argus advertising hall, Elizabeth St. 1926. 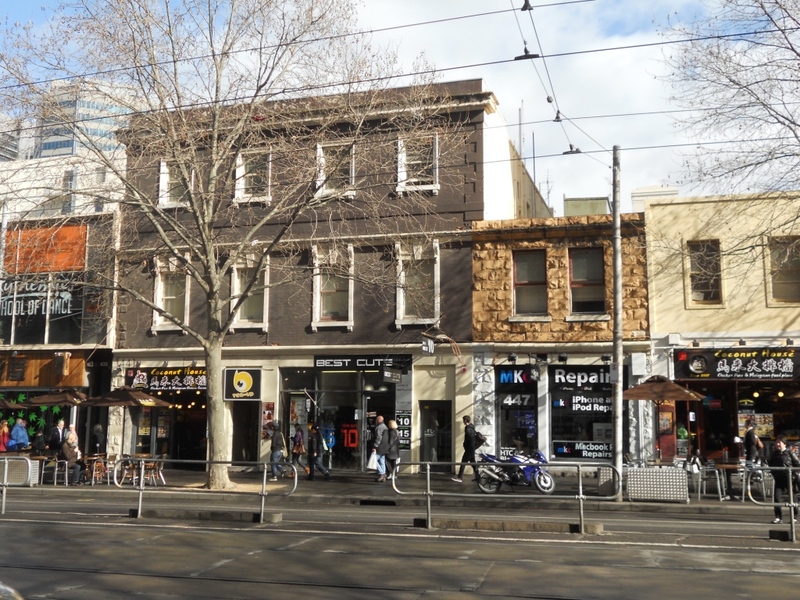 While two small redbrick buildings at nos 26-28 are likely to be replaced by 7 storey glass brick apartments, the City of Melbourne’s Planning Department has accepted our suggestion that this unique street should be examined with a view to becoming a heritage precinct. Hopefully before more of it is demolished! Built in 1969, this unusual ‘upside down’ pagoda-like tower was added to the Victorian Heritage Register, despite the former Minister for Planning publically stating that he thought it was ‘ugly’. This will hopefully prevent the clashing rooftop extension permitted by the City of Melbourne late in 2013. 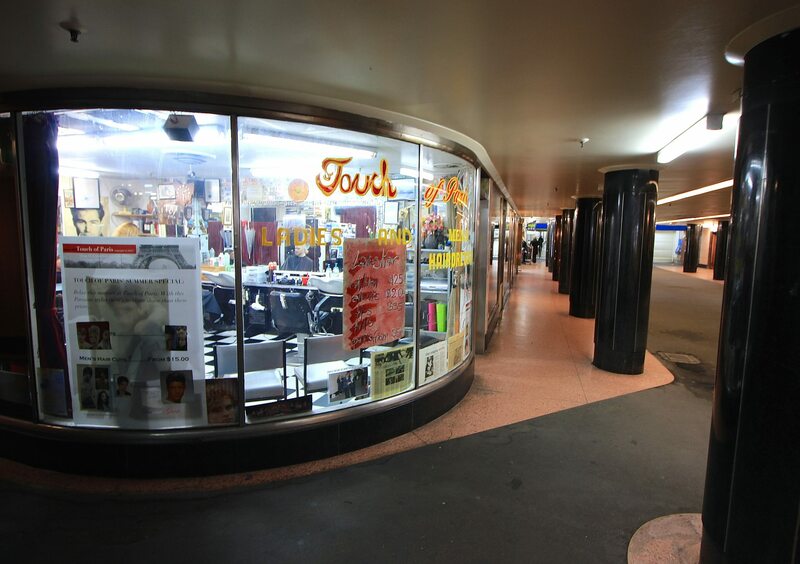 This fantastic 1956 pink-tiled space is scheduled to be added to the listing of Flinders Street Station by Heritage Victoria, finally giving it heritage protection. The former Minister appeared to have had a particular fondness for this area, and directed his Department of Planning to review controls in the area. It recommended a small expansion of the area to include more laneways and laneway buildings, higher gradings for many buildings, and stricter height limits, all of which MHA strongly supported. The Melbourne City Councillors oddly had concerns with the height limits, but there appears to be no opposition to the expansion of the precinct. A panel will hear submissions in March. The Marriner Group proposed to restore the exterior (which is in dire need after 20 years of neglect by the Marriner Group), as part of an application for a 32-storey glassy hotel next door. The proposed tower is three times the height limit, and will have a huge impact on the internationally renowned Hosier Lane. Despite strong objections form MHA, the National Trust, the City of Melbourne and others, the former Minister granted a permit September 2014, with an added condition for some unspecified ‘interior restoration’. 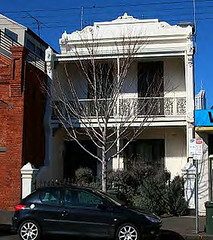 Since it is in a Heritage Overlay precinct, a VCAT appeal is possible, and has been applied for by the City of Melbourne, with support from the lobby group Keep Hosier Real. It will be heard in February this year. Melbourne Heritage Action’s nomination to Heritage Victoria was successful, and upheld after an appeal by AXF Group (who plan a 70 storey tower, despite a 60m height limit) in April 2014. The developers have however lodged an appeal against the listing with the Supreme Court. If they are successful (which is unlikely), the powers and processes of Heritage Victoria would be thrown into doubt. In January 2015 they officially lodged plans for the new tower. 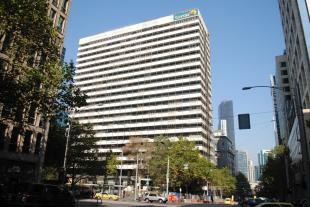 This 1872 office building on Flinders Street is proposed to be façaded for a 25 storey glass tower. Following objections from MHA and others, the design was recently modified, though not substantially. The proposal is with the City of Melbourne, and a permit is yet to be decided. 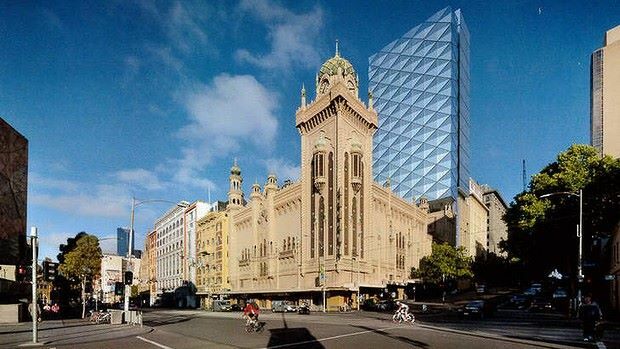 UPDATE: Just as this post was about to be published MHA received word that the City of Melbourne has rejected the proposal citing a number of ways in which the tower would adversely affect the recently heritage listed building, as well as its heritage neighbours in Queen St. It is reassuring to see council officers sticking up for our heritage planning rules and saying no to minimally setback façadism. Let’s hope this sets a precedent for 2015! In 2013 the former Minister surprisingly refused a permit that would have kept only the facade of this 1859 gold-rush hotel, with a tall tower setback only 6m. The owners then purchased the 1860s/1880 store around the corner at 139 Franklin Street (one of the many buildings in the City North Amendment that remain unprotected) and a new application was made in late 2014 which we have not yet seen. A permit for a 71-level tower partly supported on legs through the roof of this 1890/1926 bluestone landmark was granted by the Minister in October 2014 (without any discussion of heritage and despite overshadowing of the State Library Forecourt). A ‘heritage permit’ is now being sought from Heritage Victoria, which the National Trust and MHA objected to, and is yet to be decided. This 1930s/40s art deco factory building on the corner of William and A’Beckett is proposed to be heritage listed as part of the not-yet-approved City North Heritage Review, but there is also a proposal to façad it in order to allow the construction of a pair of glassy stepped towers. In some parts the towers are setback only one metre from the façade, and the tower will cast a shadow over the Flagstaff Gardens in the winter months. Despite concerns expressed by their own heritage adviser (and by MHA) the City of Melbourne officers report was supportive, and it seems likely a permit will be supported by the new Minister’s department. Two little redbrick warehouses, one c1890, the other c1920 are proposed to be left as (altered) front walls only plastered on the front of a 13-level apartment block. We objected, but since they are not heritage protected, this appalling example of facadism may not be much of an issue. The City of Melbourne is yet to decide. 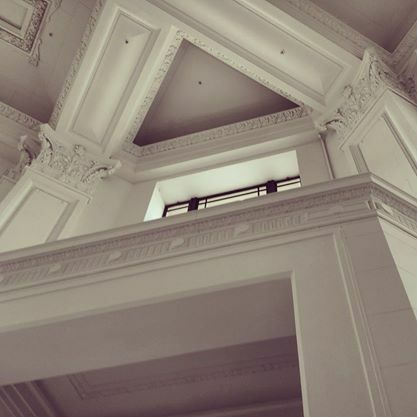 In 2014 the Halim Group won a permit from Heritage Victoria that will allow them to gut the front wing of the hotel (leaving three ‘heritage suites’ as the only original rooms). This is in addition to the permit for the demolition of the rear wing for the tower granted in 2012, but unless work starts by February the original permit expires. Approved by the Matthew Guy in October 2012, the club reportedly recently decided to sell the site, presumably with a permit for a tower that if built will be possibly the worst example of façadism in the city. If the permit is still valid, then the reasoning for the permit is lost, and the building, which gained a heritage overlay in 2013, would become a façade attached to the base of a tower, not a building. 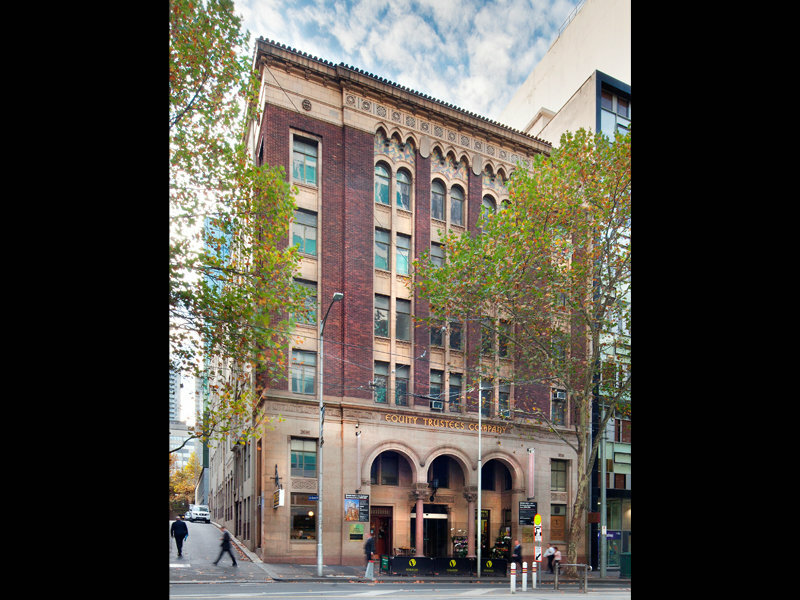 A permit for façading this 1925 red-brick building on Bourke Street near Spencer Street, to make way for a 30 storey tower set 10m behind, was granted by the former Minister for Planning in 2013. A permit for a 55-level ‘pencil thin’ apartment tower that retains only the façade of this 1908 Edwardian shipping office (but also demolishes and recreates most of the grand chamber as a lobby) was granted by the former Minister for Planning in 2013. The development was on-sold in October 2014 and pre-sales may be starting soon. The wonderful Edwardian Queen Anne building on the corner of Russell St and Flinders Lane was subject to a VCAT hearing in late 2013 when the City of Melbourne rightly opposed a 4 level addition to a 4 storey building. Sadly VCAT was swayed by the lack of guidelines and the ‘elegance’ of the proposed mesh-covered box confirming the permit in January 2014. A permit for a narrow 32-storey apartment tower popping out of the retained outer walls of this charming little heritage listed building was issued by VCAT at the end of 2013. The Wesley Church is still planning to demolish this fine 1920s Tudor style hostel to make way for an office tower to fund repairs of the church building and provide income into the future. An image of a new design has been released, but no plans lodged yet. The Charles Hotham is the rundown 1913 Edwardian hotel on the corner of Spencer and Flinders Street, and is for sale along with the adjacent 1890 Renaissance style Great Southern. Both were heritage listed in 2013, but the sale is touted by the agents as ‘an exciting development opportunity’. At least the current backpackers in the Charles Hotham have a lease until 2018. This charming 1917 red brick Edwardian, heritage listed in 2013, sits among the warehouses at the bottom end of King Street. Currently occupied by Spearmint Rhino, was sold last year with only a 12 month lease, and being a large site, could be subject to a high-rise redevelopment. The stylish Edwardian hotel on the corner of King and Lonsdale built in 1915 has long been heritage listed, but is part of collection of buildings housing Goldfingers nightclub, which was recently bought by investors who own other adjacent buildings. There is speculation that the site could house a tower up to 80 storeys. This charming 1929 Stripped Classical hotel on LaTrobe street near Elizabeth Street has no heritage protection, and was sold in the middle of 2014 with a high-rise proposal attached. This fantastic Romanesque style office block built in 1930 was subject to permits in 2010 from the City of Melbourne then Heritage Victoria, who listed it the same year, allowing gutting of the original office interiors, and a 16-level rooftop addition set quite close to the front. Those permits have lapsed, and the building was sold in 2013 to a developer with plans for a hotel ‘with extra levels’, not likely to be greatly different from permits granted previously. Great overview of the year and keep up the good work! We need to save this landmark.